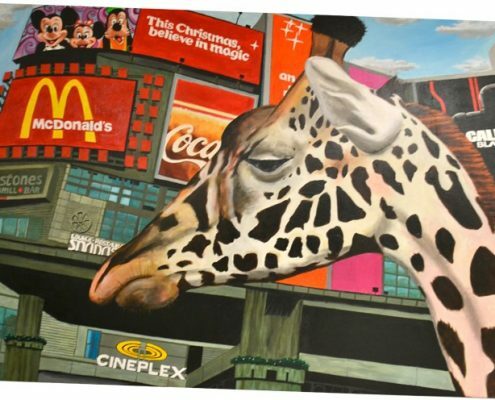 Rachelle Elie has been a Toronto-based self-taught painter, clown and comedian for the last twenty years but moved to the Carp area in 2015. Her paintings are vibrant expressions of her inner landscapes, many of which are self-portraits of one sort or another. She uses bright colors and dramatic symbolism to express her vision and share her inner journey. When approaching a blank canvas Rachelle allows the materials, colours and impulse to guide the painting. She observes the creative process without judgement and lets the message transpire. This creates a synergy of colour, shape and design, allowing the medium to speak memories, stories and truths through the canvas. This style has evolved over the years as Rachelle has painted, travelled and been exposed to different techniques and ideas. As a young girl Rachelle visited Haiti, her father’s birthplace, and these early experiences along with ongoing exposure to Haitien art and culture have had a deep impact on her work. Further travel introduced Rachelle to the work of Frida Kahlo and Diego Rivera. She later discovered Miro, Gaudi and Picasso in Barcelona, and the French Impressionists in Paris. These early visual art experiences impacted her relationship to color, design and painting. As an emerging artist Rachelle spent three months painting in the tropical retreat of Fiji, with an associated visit to Australia. The rich culture and visual beauty of the Fijian people and islands, coupled with a tour of the the Kluge-Ruhe collection of Australian Aboriginal Art in Sydney left her deeply moved and further reinforced her own approach to painting. She noticed that the aboriginal artists worked from intuition, resulting in dynamic and expressive creations. This resonated with how she had been approaching her craft for years, not only in the visual arts but also in performance. Clown, comedy and theatre involve listening and following impulses. Rachelle’s integration of the originative process creates harmony within the creative urge. 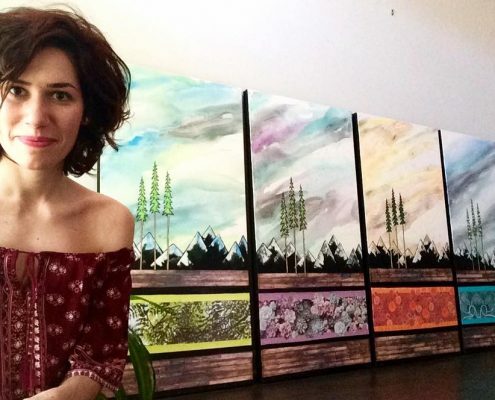 In addition to her travels, meditation has been a significant influence on Rachelle’s art. As a young woman she began attending ten-day silent Vipassana retreats. Through self-observation, this type of “insight meditation” aims at uncluttering the mind and bringing inner peace to the meditator. The central figure in many of Rachelle’s paintings is a woman, eyes open or closed, in a contemplative stance. The shapes and details around the central face often represent mindful breath, a personal struggle, or an inner challenge. Rachelle’s years of acting training also involved inner search and self-reflection; ideas that often find their way into her drawings and paintings. Recently Rachelle had the opportunity to turn that reflection outward; over three years she spent several months living and travelling in Kenya. While there Rachelle facilitated an eight-week course with thirteen HIV-positive artisans, teaching her own self-taught and process-based art. In 2009 she co-founded the Imani Artist Collective in Eldoret. All of the artists were living in deep poverty. Although none of the artisans had ever painted, when brought to a blank canvas all were creatively free, in a way very unlike artists in North America. The art produced through this process centred on self-reflection, truth-telling, honest impulsivity, and – ultimately – process over product. The Collective’s work is documented in a book entitled “Living Positively: Kenyan Artists Paint Their Truths.” Their art is on permanent exhibition at the Riley Mother-Baby Hospital in Kenya. Upon returning from Africa Rachelle has embarked on a new series of paintings and drawings. Several pieces were completed in Kenya and some have been completed upon returning to Canada. 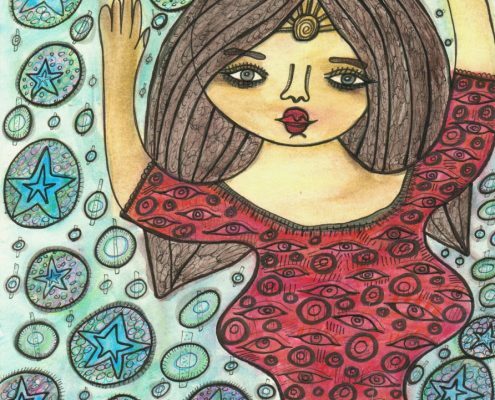 Her work continues to deepen as she commits to her inner process. Rachelle’s work is in many businesses and private collections in Canada, US and Kenya. Art has always played an important role in my life. I’ve enjoyed taking art classes throughout school and have always sketched and painted in my spare time. My friends all knew that they could find me working in the art room during lunch hours at high-school; I just couldn’t get enough! It was only in the past five years though that I’ve truly developed my love for painting with acrylics and mixed media. Inspired by landscapes and wildlife, I incorporate different textures and many bold colours into my work. I find inspiration for art in the surrounding area. Often times I will see something that inspires me while driving, which always leads me back to my paints and blank canvas. I grew up in the Westport area and have since followed my career as a chiropractor to Carleton place where I own a clinic, Abundance Chiropractic & Wellness Centre. I still make lots of time to paint and explore my creative side. Art for me is a fabulous way to de-stress, and unclutter my busy mind. 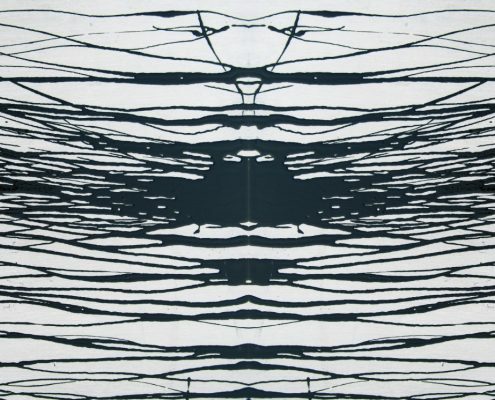 My techniques are always growing and changing and I find this to be one of the most exciting features of my art journey. More recently I have been leading local Paint Nights. I love being a part of others art experiences and have discovered that helping others to explore their creative side is one of my biggest passions in life. I think it’s important for all of us to tap into our creative sides. Whether you’re interested in visual arts, music, dance, or gardening, I encourage you to be creative and to never hold back. 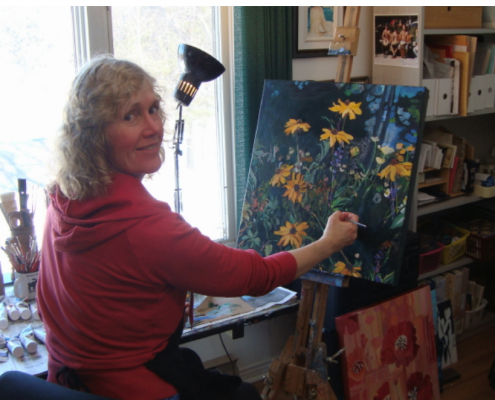 I was trained in graphic and fine arts in Ottawa and Haliburton, Ontario. I have been exhibiting and selling my work in watercolour, pencil and acrylic since 1982. My style and subject matter have shown wide diversity over the years. Recently, I have begun to focus on landscapes, florals and music themed pieces, though in earlier years I was fascinated with the figure and took many life drawing courses and workshops. I am still excited when I receive a portrait commission, and I sometimes weave the human form or face into landscapes or abstracts, either intentionally or subconsciously. I am inspired by a love of the outdoors, having spent much of my youth in a rustic, log cabin near Gatineau Park. I now enjoy sketching and painting at our cottage in the Haliburton Highlands, which has become my second studio. I love to travel and many of my art works are based on sketches and photographs brought home from local and remote wild places and trips abroad. Some of my work is highly realistic, while I also enjoy playing with reality by means of abstraction and metamorphosis. If you visit my gallery, you will see paintings in many stages of completion. There is often a stick of conte or a pencil lying around for times when I see something I wish to add or change before it is complete. I know that art isn’t always static. Sometimes pleasant images appear quickly and easily, while other times they evolve slowly and over time. I began my artistic training as a teenager during a four year art program in Ottawa, after which I sold pencil portraits on commission while working in a gallery in Hull, Quebec. I went on to study literature at Trent University and education at the University of Ottawa. After this, I spent many years working with young children while selling my work at shows and in galleries. I am happy to welcome visitors to our Carp River Studio, here in the lovely and serene village of Fitzroy Harbour. In my large studio overlooking the Carp River, I offer art classes to children and adults. Classes are relaxed and reasonably priced, as well as being flexible to fit any schedule. Growing up in Toronto, I always loved to draw. In high school I became interested in the logic of Science and Math, as well as the creativity of Art. At university I studied Engineering, but I found it was not creative enough for me. So I enrolled in a program called Industrial Design at Carleton University. It was here that I learned about the design process and the history of the modernist movement in design and architecture. I was intrigued by the purity of the socialist movement of minimalism. After graduation I worked as a product designer in several large and medium sized companies before becoming a Design Consultant. As a break from design I took a night class in figure drawing at the Ottawa School of Art. Here I found a teacher that, over four years, took me through the process of finding my mature style. I started with life drawing, figure painting before settling on abstraction. Living in Ottawa gave me the opportunity to visit the national gallery and become familiar with the language of art. As I continued on my artistic journey, I became inspired by the culture of Pop Art and later by minimalism. After exploring a variety of techniques, I became confident at applying paint with a trowel. I was so intrigued by the learning process in the studio environment that I enrolled in teachers college and went on to teach communications at high school. I took time off from painting to work and raise a family. In 2014 I had a serious motor vehicle accident. As part of my physiotherapy I returned to art. Interestingly I started back again with drawing, printmaking, and woodworking before settling back into abstraction. Urged on by a friend I entered my work in juried shows and was pleasantly surprised by the warm reception I got. I was encouraged by the feedback and surprised to discover an enthusiastic audience for my work. I have participated in several shows like the New Art Festival in Ottawa. My goal now is to get my work out into the community and create a dialog with my audience. One of the things I really like about showing my work at a restaurant like Alice’s is that it is a vibrant thriving space at the center of the community. I hope to be able to create art and show in the community for years to come.